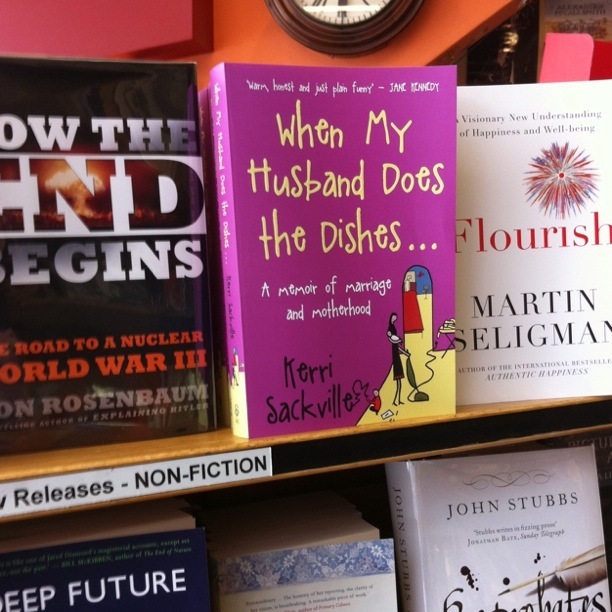 Sometimes my planning just fails – I’m double booked! Today I went to work. I received an email asking me about my anticipated days of leave during the Easter break. In the peaceful, relatively quiet silent office, I check the diary. I looked up the book club reminder email about next week’s meeting and sorted out my leave days for after the Easter break. These days of leave are to ensure that I can travel to Sydney to go to a book launch. 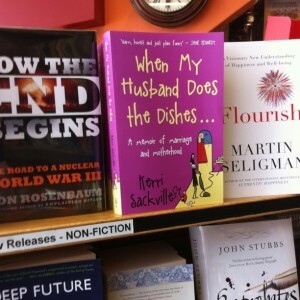 Not just any old book launch but the launch of Kerri Sackville’s book, When My Husband Does The Dishes. It was a quiet audible expletives deleted exclamation of surprise when I realised that next month’s book club date was Thursday 28 April. Next month I am presenting for book club, Kylie Ladd’s first book, After The Fall. In case you are not keeping up with what a total balls up this is, let me explain. Robert and I have had some lovely Valentine’s Days. While neither of us are particularly in favour of the day itself, we do chose to do something nice for each other. Today was quite a difficult day. It was Monday. We had visitors at the weekend. Our baby was sick. Here’s our Valentine’s Day 2011. Me ~ Didn’t anyone tell you? Romance is dead. Him ~ Bugger, what have I been doing all these years? Me ~ I love you more than valentines day. Him ~ Do you love me higher than I can reach? Me ~ Much much higher than even when I am on my tippy toes. Him ~ Higher than I can jump? Me ~ That’s pretty high. Him ~ I can jump over the moon. 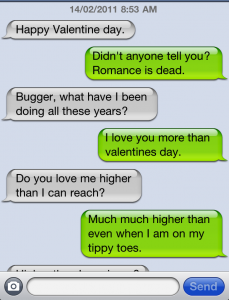 Him ~ But not as high as my love for you. Date night … where to go? What to do? Robert has a lot of good ideas. He has also been a parent before and he knows secret parenting things that first time parents don’t. Things like how to fit car seats. How to get rid of poo – magically like it was never there. How to do things one-handed. He also knows about baby sitting. And round-robin baby sitting circles. Robert values his family and his relationship. He knows that couples need to spend time together away from their children to stay sane. So we set up the baby-sitting circle. What a brilliant idea. One couple go out, another mum minds their baby. The dad minds his own baby. The babies get to stay home. There is couple time and then also the bonus of alone time for the other two. Last week I packed my book and my nail file (of course!) and headed over to mind my lovely favourite baby girl for my friends. It went well. The gorgeous baby slept. The was dinner delicious. My nails got done. Their stereo is better than ours – much better. Another bonus, a night off jobs! No work to do at someone elses’ house! This week is our turn. Tomorrow! I have no idea where to go or what to wear. Not much time now to decide. Adult conversation here we come! Ideas please. Everyone is sick. All the mamas and all the bubbas. The Tuesday morning mothers’ group only had five mums and bubs. The babies are snotty and grizzly. It’s Canberra. The weather is on the turn and the wind is blowing. While we all struggled through the week, on Friday there was a little golden moment of peace and bliss. In the mid morning, Benedict fell asleep on my lap. He hasn’t fallen asleep deeply in my arms since he was a tiny tiny boy. He is now too big to fit neatly but his languorous limbs fall gently over my lap and on to the chair. His little face was pressed into my chest and he slept peacefully for a while. His rhythmic breathing and steadily beating heart were soothing to me as well. I had plenty of time to study his outrageously long eyelashes and sweet features. The surprise was that he did it twice. On Saturday it was an hour and a half. Luckily I was prepared with blankey and book. Glorious to comfort your child so completely just by lying still. Keeping on keeping on – Jenn this one is for you! I promised to blog today. Benedict woke up at 1-30am and then again at 5am. I went in a 5am to find him face down and unable to get himself right side up again. After a feed and a cuddle with mama the day officially started at 06-30. I took the chance at 08-30 to have another thirty minutes sleep and not have a shower. I knew what this would mean. To have a shower with an awake baby is not easy. I set up a great activity centre in the hall – closed all the doors. Benedict was sitting in the midst of his fun filled hall and I went into the shower. I was all wet when the little hand appeared on the tiles – having crawled in to find me he discovered someone had locked his mama in a glass box and turned on the water! For the next two minutes I tried to have a shower while he wailed and banged on the door. Great! That 30 minutes of sleep though – still worth it. Now I have been home alone solo-parenting for 5 days. I am tired. My throat is scratchy. I have taken a number of shortcuts. I have stopped changing the night singlet for an under onesie in the day time. One less piece of washing. I haven’t wiped the highchair after every single meal. I left Benedict in the car outside the coffee shop while I got my coffee. (He was in plain sight all the time and the windows were down. He was wide awake and able to scream his lungs out if necessary.) He didn’t even stop smiling. I had a long chat with the other mums at mothers’ group about our various concerns. To some extent we are all up against it. Even now. Even though some of the babies are nearly 9 months. We are all still learning. Some of us are getting dangerously small amounts of sleep. But we have to keep going. My challenge at the moment is to keep on keeping on. Or as they say in England – Keep Calm and Carry On.